We begin our search for wild chaga (Inonotus obliquus) near Fairbanks, Alaska at the subarctic latitude of 65° N. Temperatures here range from -60° F in the dead of winter to almost 100° F during the summer. The extreme climate is further intensified by available daylight ranging from less than 4 hours on the winter solstice to nearly 24 hours a day during the summer. Our search takes us into regions of dense forest where we use our knowledge of forest succession and other biogeographical factors to help locate the most fruitful harvesting locations. 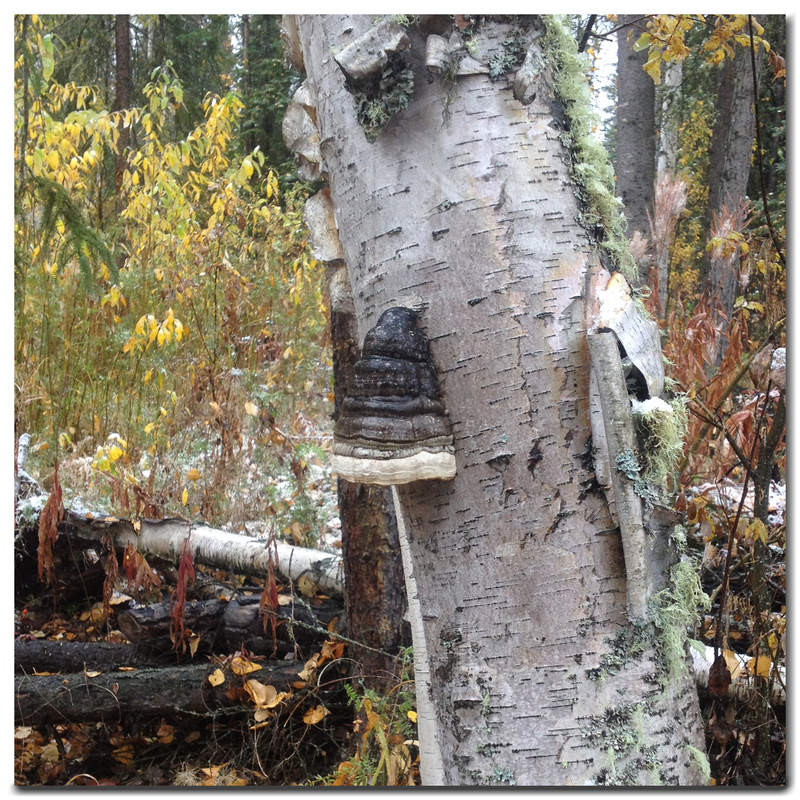 Guidelines in Alaska mandate that harvesting wild chaga should not damage the birch tree host. We exclusively harvest large chaga conks growing below a height of 20 feet on mature paper birch trees (Betula papyrifera). To avoid causing unnecessary damage, we do not climb trees and instead selectively harvest chaga that we can safely reach from the ground. Leaving smaller pieces behind promotes future chaga growth and we do not put the tree at risk for harvest damage for only a small amount of chaga. And of course, we never cut down any trees. Our methods allow trees to recover quickly from harvest while promoting chaga regrowth, providing an environmentally sustainable harvest method for this precious natural resource. 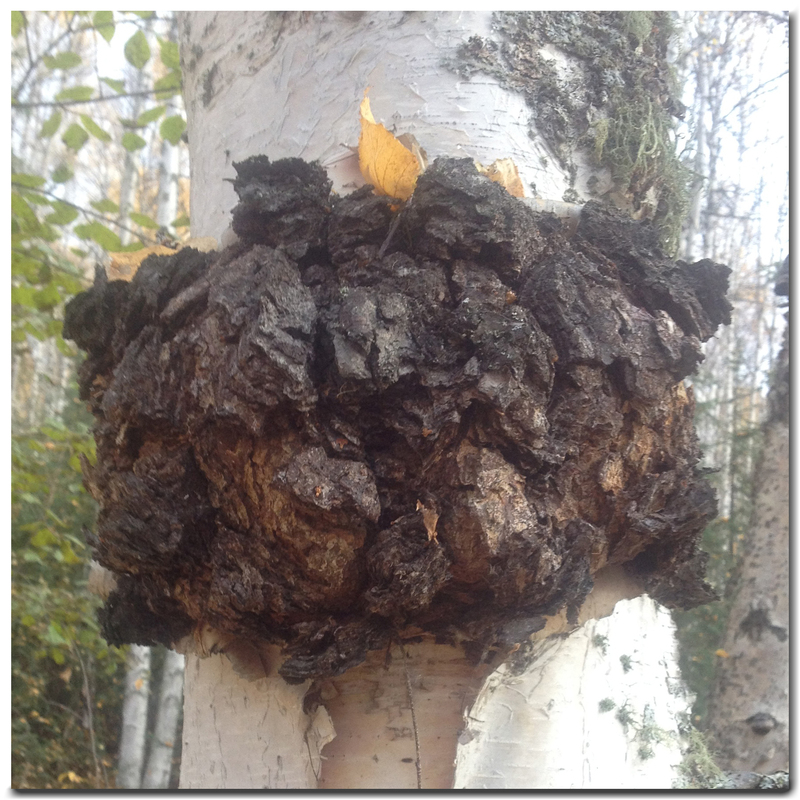 Chaga is a fungal parasite that feeds off nutrients provided by birch trees. There is a common misconception that chaga is somehow beneficial to the trees. After spending thousands of hours in the forest, we have seen countless fallen birch trees where chaga appeared to be responsible for the death of the tree. By removing the parasite the life of the host may actually be extended. Pictured below is an example of a tree that died and fell due to the chaga infection. We do not use any gas powered vehicles or tools to harvest chaga in the Alaska wilderness. Instead we rely on more primitive methods and our own physical strengths. This ensures that we leave our harvesting locations closer to the pristine state in which we found them: free of vehicle tracks and pollution. 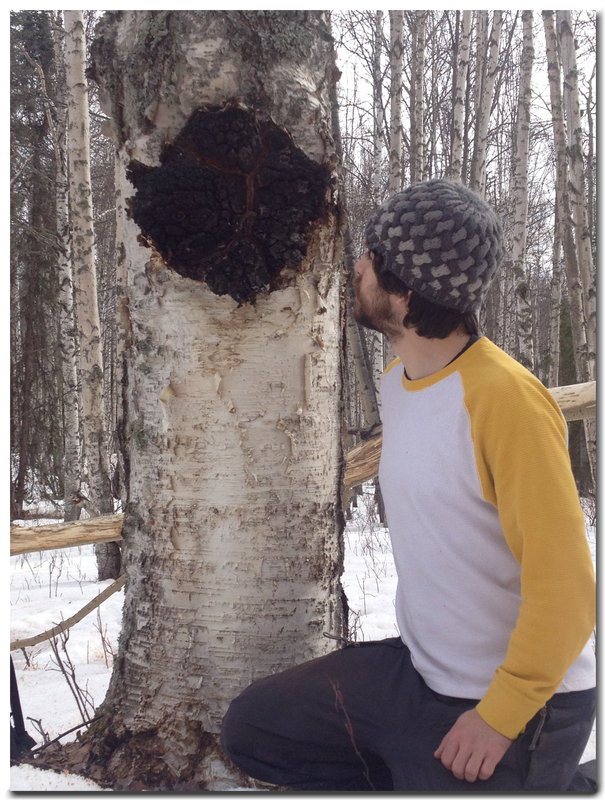 We remove chaga conks by “popping” them off leaving a thin layer of chaga mycelium on the tree. By employing this technique we do not dig into the tree or remove tree bark thereby exposing trees to further infection. 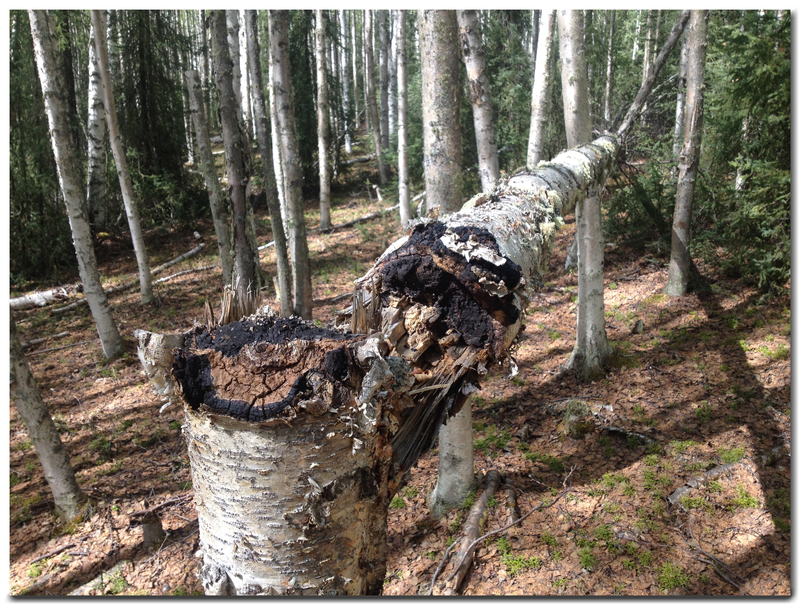 We never harvest chaga from dead trees because when the tree dies, so does the chaga and the beneficial nutrients quickly diminish. Also, we never harvest tinder conk (Fomes fomentarius), false tinder conk (Phellinus igniarius), or burls (all three pictured below). To maximize freshness and quality, and to minimize microbial growth, we use clean tools and carrying vessels and begin processing our chaga as fast as possible. 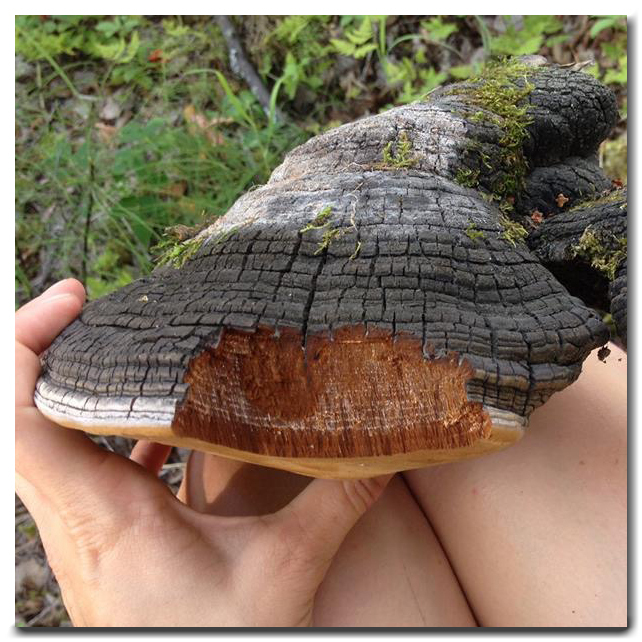 Read more about how we process chaga here.